Short Creek is a unassuming place along the east side of the Tennessee river in south west Perry County, Tennessee. This undated photo looks like it was taken in the late 1930's or early 1940's. That matches the other evidence I have for a branch at Short Creek. The chapel was built in 1928 and dedicated by Charles Callis. Attendance was small, often only consisting of only the Richardson family. 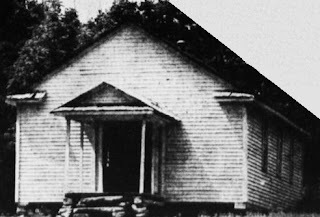 In 1930 Jensen noted in his encyclopedia that there was a Sunday School at Short Creek, Tennessee. It wasn't a branch then and he specifically did not include it in his list of the three branches in the state that year. But Alvin Richardson serve as the President from 1928 until 1942. Exactly when it was considered a branch is vague. By 1940 references were using the word "branch" instead of Sunday School. In 1942 Marvin Dedrick was set apart as the new Branch President, a position in which he served until 1972. I also have this dated photograph from 1944. I looked at the names associated with the Short Creek branch I find a few who appear to be related to members from the earlier Spring Creek and Cedar Creek branches. This makes sense because those two historic branches were respectively south and north of Short Creek. But Short Creek included members from West of the Tennessee River and over much of Perry County. 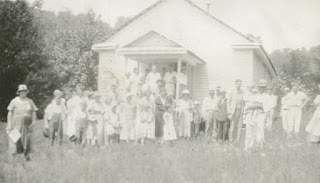 Another Sunday School met at Pope, Tennessee in Northwest Perry county. In 1960, the branch moved into the old Lego Schoolhouse. It was only 1.5 miles away, so convenient for those who like the location of the old building. Unlike the previous building, this one had running water and indoor plumbing. Sadly, I don't have a photo good enough to share. In the mid 1970's the branch had outgrown the Lego Schoolhouse and a new building was planned. A more central location was selected, in Linden, Tennessee. Members west of the Tennessee River were organized into their own unit putting Short Creek out of its central location. The efforts to fund the new building and justify the efforts led to the branch becoming a ward in the late 1970's. At the same time a new name was in order, so the Short Creek Branch became the Linden Ward. This new building is still in use today.